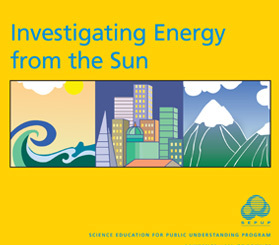 Investigating Energy from the Sun is a SEPUP module designed for use in grades 6–12. The module contains a series of 7 activities that provide approximately 3–5 weeks of instruction. This module focuses on the physical properties of electromagnetic energy given off by the sun. Most of the energy the earth receives from the sun is in the form of electromagnetic energy. In this module, students explore the physical properties of electromagnetic waves given off by the sun.The physical properties of infrared, visible, and ultraviolet radiation are explored using the concepts of selective transmission, reflection and absorption. Through an established story line, students use evidence to establish a relationship between the physical properties of ultraviolet waves and their associated health risks of cataracts and skin cancer. Students then determine ways of reducing the overall risks associated with ultraviolet exposure. Students are assessed on their ability to analyze data. What else would you like to know about this module?